1. Missing/Dead women in the North Bay, specifically the recent deaths on Mount Tamalpais and the disappearances/deaths 4 years ago in and near Point Reyes. We’ve covered this RIGHT HERE. 2. Missing men of San Francisco. This is something Eve really brought to my attention, and something we’re going to do a better job of examining here. 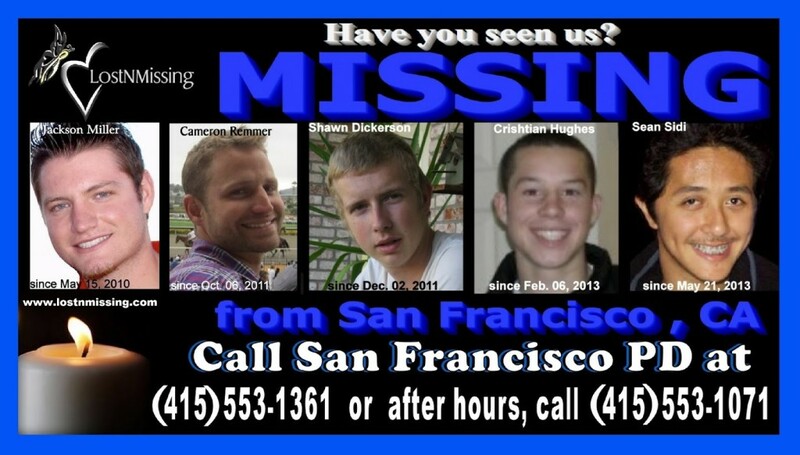 Six young men, all from different backgrounds and with relatively different circumstances, have gone missing in San Francisco in the past 3 years. A few of the missing men were found dead. One of the men, a 23-year old from Brazil, called friends and family from San Francisco to say he was being followed, was in trouble, and needed help. His body was found in McCovey cove. Authorities don’t think these cases are related. This is a big city, that’s entirely possible. But THAT’S A LOT OF MISSING GUYS. 3. The murdered old couple in Florida. A couple in their late 80s was found murdered. The husband’s decapitated body was found in the garage of their million-dollar home, the wife’s body was found in the lake of their gated community. I’m going to guess that this was a home invasion gone wrong, and the house was accessed by the water. As of today, the case remains unsolved and is all over the cable news channels. One odd thing about this case I’ve noted is that the photos of the couple seem to be like, passport or driver’s license photos. God forbid I go missing or murdered, please use a cute photo. All of these stories are incredibly sad and quite frankly, pretty scary. What we find most frightening is the unknown. A mystery is always interesting, but under circumstances like these, it can be terrifying as well. Stay safe, and text us when you get home.